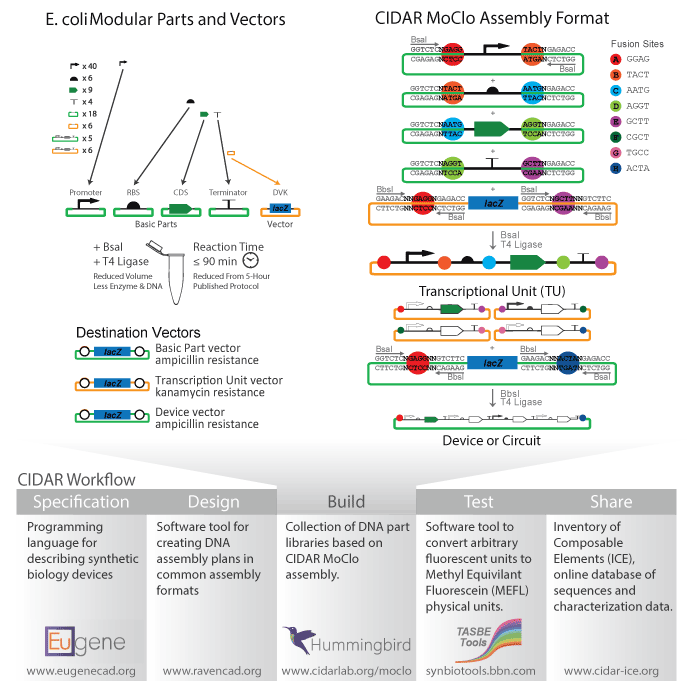 The Cross-disciplinary Integration of Design Automation Research lab (CIDAR) MoClo Library is collection of modular DNA parts and enhanced MoClo protocols to enable rapid one-pot, multipart assembly, combinatorial design and expression tuning in E. coli. CIDAR MoClo: Improved MoClo Assembly Standard and New E. coli Part Library Enable Rapid Combinatorial Design for Synthetic and Traditional Biology. Iverson SV, Haddock TL, Beal J, Densmore DM. ACS Synth Biol. 2015 Nov 4. doi: 10.1002/bit.25814. PubMed . The CIDAR MoClo Library contains promoters, ribosomal binding sites, coding sequence, terminators, vectors, and a set of fluorescent control plasmids. Optimized protocols reduce reaction time and cost by >80% from previously published protocols.